Vantage Travel has curated deluxe river and small ship cruises, land adventures, safaris, family and culinary journeys since 1983. In 2019, Vantage is adding Cornell University-trained concierges for customer service and focusing on solo travelers with solo-friendly cruise departures and solo-only land adventures. While the line already has solo cabins on its riverboats, Vantage will debut in 2020 additional solo cabins with French balconies onboard its fleet in 2020. In the coming years, Vantage will expand both its portfolio of journeys and fleet with the Egypt-based m/s Nebu in 2020, the ocean-going m/s Ocean Explorer in 2021, and the m/s Odyssey in 2022. Travelers can book directly with Vantage’s customer service team. The company has a newly expanded focus on customer service, with weekend hours for reservations, an effort to reduce response time, and Cornell University-trained concierges on all journeys. River Splendor has 92 cabins divided into four room types, ranging from 125 square feet to 330 square feet. Most have floor-to-ceiling windows with French balconies. 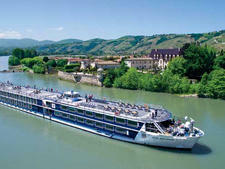 Vantage specializes in worldwide river cruises, land tours, and small-ship voyages for travelers 50 and over. The company, which celebrated its 35th anniversary in 2018, owns and operates its own fleet of European river ships sailing the Seine, Rhine, Main, Danube, and Moselle rivers, and will add two new small ships to its fleet in 2020 and 2021. 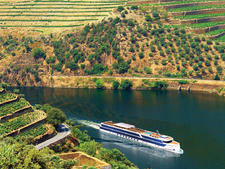 Vantage also operates exclusive charters on the Douro River in Portugal, and its small-ship voyages feature chartered vessels (most are exclusive charters) operated by companies such as Hurtigruten, Pandaw and Variety Cruises. These range from boutique-style luxury yachts to expedition vessels. 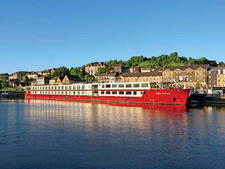 Vantage maintains a 4:1 guest-to-staff ratio on its riverboats. Most cruises offer free ship-wide Wi-Fi, included sightseeing tours, meals, beer and wine with dinner and onboard entertainment included in the price of the cruise. Meals onboard are one sitting with open seating. All ships have panoramic lounges and sun decks, and are nonsmoking throughout the interior, with a designated smoking area at the rear of each vessel on the open-air deck. Vantage owns four riverboats, each with custom-built solo accommodations, French balconies in 78 percent of the cabins and a luxurious 250- to 330-square-foot Owner's Suite with a well-stocked minibar and separate bedroom area. Standard and Deluxe cabins are furnished with twin beds that convert to double size (queen for the Owner's Suite). All cabins provide outside views and are equipped with TV, safe and hair dryer. They also come with entertainment-on-demand systems offering movies as well as access to many U.S. television channels such as MSNBC, CNN, Discovery, The Weather Channel and more. The features include real-time GPS tracking of the ship's journey. The line's Cultural Connections programs promise in-depth experiences in each country visited through lectures, special meals, home visits, receptions, performances and participation in local activities. During walking tours and excursions, Vantage provides free headphones to ensure passengers can clearly hear the commentary, instructions and lectures. Vantage is marketed to well-traveled passengers ages 50 and up, as well as solo travelers. In 2019, solo travelers will enjoy a greater number of custom-built single occupancy cabins on Vantage's European fleet, or make use of a roommate matching service in double-occupancy cabins. Solo travelers on cruises can attend fun, informal Solo Connection get-togethers, facilitiated by the Cruise Director, reserve a solo-friendly departure cruise and reserve a solo-only land adventure. With amenities such as U.S. television channels, a U.S.-style electrical outlet in every cabin and English-speaking guides, Vantage is intentionally designed with the American cruiser in mind. Vantage currently sails a handful of custom-designed river ships in addition to several exclusively chartered vessels built to its specifications, all with outside cabins. The newest ship, River Voyager, joined the fleet in 2016. 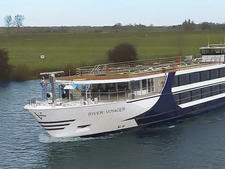 The other river ships include River Navigator, River Splendor, River Venture and River Discovery II; two others, the Egypt-based Nebu and the five-star, ocean-going Ocean Explorer will join the fleet in 2020 and 2021, respectively. Vantage's 360- to 442-foot-long ships offer airy public spaces, a rear-facing Captain's lounge with retractable roof, flat-screen TVs in cabins and free WiFi access throughout the ship. 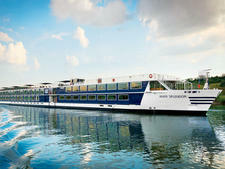 Vantage also charters the 126-passenger ships Douro Serenity and Douro Splendour for Portugal's Douro River. In Asia, Vantage charters the 398-passenger Century Legend, which sails China's Yangtze River, as well as the Jayavarman on the Mekong River in Cambodia and Vietnam, and the Makara Queen on the Irrawaddy River in Burma. A number of the cruises aboard these ships are more adventurous. Ocean-going ships that Vantage charters from other cruise lines include Variety Cruises’ Harmony V for the Mediterranean, Hurtigruten’s ms Fram , ms Midnatsol, ms Roald Amundsen and ms Fridtjof Nansen for expedition cruises in Antarctica, Victory Cruise Line's Victory I on America’s Great Lakes, the Santa Cruz II for Galapagos cruising, and the riverboat Zafiro for exploring the Peruvian Amazon. Vantage also exclusively charters the La Perla, a luxury yacht, to sail the Mediterranean. The 130-foot ship sails coastal Adriatic itineraries from Dubrovnik to Zagreb and has room for 26 passengers.